The Conveyor Log Loader No. 364 is made entirely out of crackle, or hammered tone finished sheet metal, and was produced between 1948 and 1957. This accounts for its only variation during this period. This self contained accessory would load logs via a conveyor belt into a No. 3451, or No. 3461 Operating Flat Car. This car was not included with this accessory. 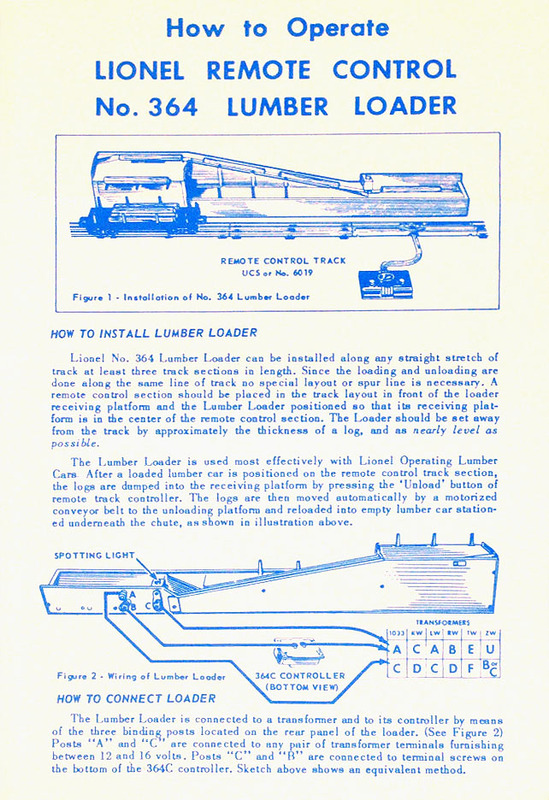 The Log Loader came with a light cover that would illuminate during operation. This cover has one RED two GREEN lenses. This log loader could be used in a continuous operation with a UCS or No. 6019 track section placed in front of the unloading bin. It is, however, necessary that the track is raised off the ground somewhat to facilitate unloading of logs from a No. 3451 Operating Flat or similar car. 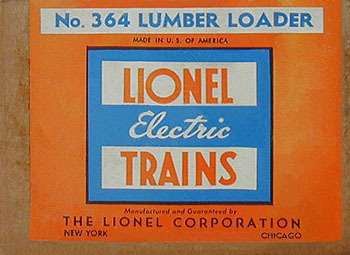 Lionel had a problem with the logs snagging the triangular block at the top of the conveyor. Originally, there was a slight over-hang to this block that stopped the logs from rolling down into the car. This problem was repaired in 1950 by bending a tab in the back metal surface out at the front of this block that allowed a smooth transition for the conveyance of the logs. This accessory came with five logs (No. 364-64) that were contained in envelope No. 364-92. These logs were stained after 1954. Also enclosed was a No. 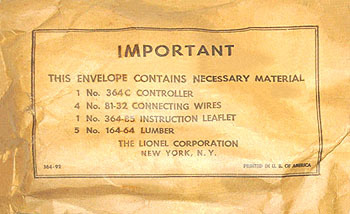 364C Controller that is shown below to the right. This controller sometimes has only two binding posts instead of the three that are illustrated. Lionel would use this controller for many other accessories like the No. 362 Barrel Loader. Variation A: DARK GRAY crackle finish. 1948 Production. Variation B: SILVER-GRAY hammered tone finish. 1949-57 Production. Dimensions: 27-7/8 inches long, 3-3/16 inches wide, and 4-1/8 inches high.